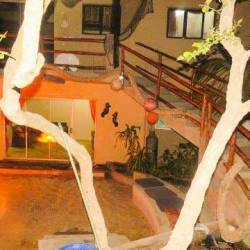 Xai Xai Eco Estates House 23 is a 4 bedroom (10 sleeper) house situated in a secure estate. The lovely holiday house has open plan living areas with fully fitted kitchen, lounge with DSTV, dining area and an outdoor deck with private pool, outdoor undercover dining area with gas braai and endless ocean views. There are 2 bedrooms with extra length king size beds, one bedroom with extra length twin beds and the 4th bedroom has four extra length single beds. Two of the double rooms have en-suite bathrooms. There is a 3rd bathroom which bedrooms 3 and 4 share. All bedrooms have air-con and mosquito nets. A double carport is provided for guests staying in House 23. Pour on the suntan lotion, grab a recliner, soak up the sun and enjoy the blissful views! Guests shall be responsible to the lodge for any damage to premises, furniture or other objects. Or for the removal of any item from the premises.